A vacation home like no other! Enjoy this spacious, newly decorated, five-bedroom, five-bath home with an adjoining two-bedroom, two-bath, guest cottage. 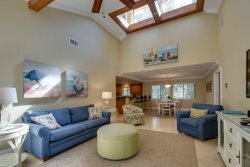 Conveniently located on the fairway in the exclusive Sea Pines Plantation, this property is just a short walk to the beach and the new Beach Club. Just three steps up to the entrance of this home and through the foyer; you will find the living room which offers plenty of seating and a large TV. An additional seating area provides a fantastic view of the pool and golf course. This luxury home has a gourmet kitchen, fully equipped for all your cooking needs. The large kitchen includes a breakfast nook that has a bench and three chairs, sitting up to six comfortably. Off the kitchen is an over-sized dining room, with a table that seats 8 along with a smaller round table that seats four. On the first level you will find the master bedroom with a king bed, TV, DVD/VCR, and a private bathroom with a separate tub and shower. Beside the master, the second bedroom includes two twin beds, TV, and a private bathroom with a shower/tub. The next bedroom offers a double bed, TV and private bathroom with a shower. Two additional bedrooms are located on the second floor: one with a king bed and one with two twins. Both bedrooms have walk in closets and private bathrooms. Completely separate and private, yet only a few steps from the main house, the two bedroom guest cottage elicits serenity. It has a cozy living room with a sofa, chair and TV, and an efficient, fully equipped kitchen. Enjoy your meals with a view of the golf course in the dining room for four. The first of the two bedrooms has a king bed, TV, and bathroom. The second bedroom has two twin beds, TV, and bathroom. Arguably the best feature of this home is the outdoor living space. Entertain guests or simply relax under the gazebo, on the furnished patio, or by the large sunny pool. Wherever you choose, plentiful seating and beautiful views of the golf course await. House lovely and spacious to accommodate our party of 13.5. Would recommend a stool or steps for king size bed on first floor due the height of the bed .